Castlevania: Lords of Shadow debuted in 2010 and changed everything we know about the age old franchise. Yes, learning Gabriel Belmont’s new tale lead to one entertaining reboot, but many fans cried fowl due to the more action-oriented – or “God of War like” take on the franchise. Honestly, I thought it was a great burst of fresh air, pumping new life into the archaic structure that had been relatively the same for years. 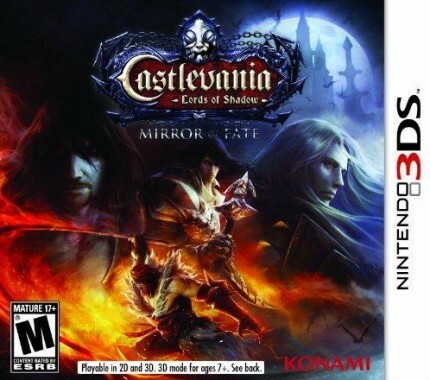 Well – like it or not, we now have a follow-up for the 3DS by the name of Castlevania: Lords of Shadow – Mirror of Fate. This title keeps it in the family, bringing together three familiar protagonists as they work together to achieve one common goal. Does this “Mirror of Fate” reveal a healthy future for the series, or would it be better off taking a stake to the heart? Let’s find out. If you have followed the Castlevania franchise, Mirror of Fate is going to be either a trip down memory lane – or a predictable, yet pleasing romp with three famous characters. That is because this title sets out to bridge the gaps in-between three major plot points, furthering the narrative of the Belmont clan. 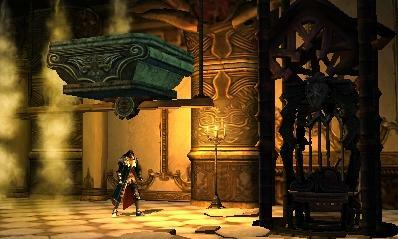 Players start the game as a young Simon Belmont – shortly after the events of Lords of Shadow in which Gabriel turned to darkness and became Dracula. Not too long after, we then take the role of Alucard, while later filling the shoes of Trevor Belmont. Seeing a trend? Well, that is because these three arcs flow backwards, each ending to set up the fate of the next character. I imagine this way of storytelling won’t click with everyone, but the writing is exceptional within this handheld Castlevania and because of it – Mercury Steam have executed the task effortlessly when it comes to intertwining these tales into one cohesive plot. Each story is driven by emotion and handled with grace, so even though you won’t be spending a ton of time playing as Simon, Alucard, or Trevor due to the 8-10 hour length of the overall experience, you will still feel that great impact as fates become reality. If I had one gripe with anything here, it would mainly be that this is a very predictable game. Going backwards, it’s not hard to figure out where the next character will end up and even though the plot points stand strong on their own, Lord of Shadow – Mirror of Fate does kind of make many revelations obvious – taking a bit of wind out of the many “shocking blows” that are delivered much later. 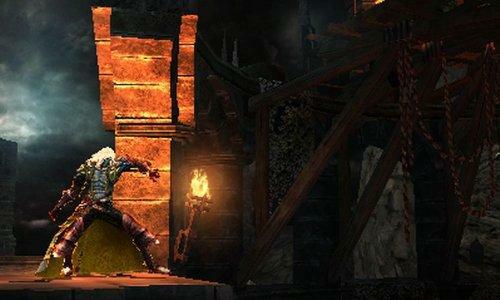 Yes – it’s still Castlevania and die-hard fans may have a few frustrations accepting these new plot devices, but those who go in with the word reboot still fresh in their mind will come out quite pleased with the excitement this handheld sequel has to offer. When you attempt to take two methods of gameplay and blend them together into one experience, it can be a tricky thing to pull off. That is what Mercury Steam have went for with Mirror of Fate – and for the most part, it works quite well. You see, this title blends together the classic 2D stylings of the older games with the new action-oriented combat to make up one nostalgic yet fresh result. While each character features different special abilities and skills, the core fighting comes down to the whip that can be used for close or ranged combat. If you enjoyed the hack and slash fare from Lords of Shadow, you will feel right at home here as that is the main course of the gameplay. Thankfully, each hero’s whip performs like a champion – but that in itself may also be it’s greatest downfall as the standard foes in the game rarely require anything more than a differently ranged shot to take out. Sure, there are plenty of special skills that are added as you gain levels, but rarely is it required to do anything other than tap away and watch your powerful toy destroy everything in sight. There is some strategy involved when it comes to tackling large groups are handling flying enemies due to the two different ranged buttons and button combinations for larger attacks, but for the most part, the combat with the whip stays relatively the same, which is fine for the weapon itself – but not so great for those lesser used pick-ups found as you progress onward. 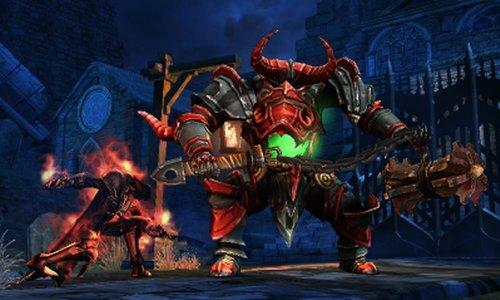 One of the biggest changes to expect with Mirror of Fate are the platforming portions. Trevor, Allucard, and Simon are controlled with the circle pad, which allows for much more fluid movements. Unlike the past Castlevania games, the D-Pad is now used to change secondary weapons, so this method is your only way of traversing to the next area. Platforming is rather simple for the most part, as climbing ledges, repelling, double jumping, and performing almost any input based on movement can be executed just fine, but players have to be extremely careful, as the circle pad is also used to run based off sensitivity. This means that if you don’t take it slow, you will find yourself falling from a ledge or overshooting a platform quite often. Dodging also requires a combination of the shoulder button and a tap backwards, and must be handled with the same diligence to not risk rolling back into the path of a swarm of foes. Now, I didn’t have a lot of trouble with this after practice, but I do feel that at least the option to use the D-Pad as a back-up for these sections would have been more ideal. I remember also when Lords of Shadow was released, a lot of controversy arose due to the heavy usage of quick-time events. 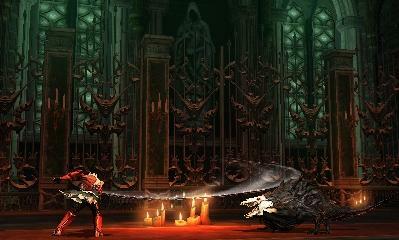 Those QTE’s are still very relevant in the follow-up, but are mainly used for boss battles. Now, don’t let that scare you off, as these epic showdowns don’t all include a timed-button mashing theme. A good portion of the time, players are required to use their special skills and take advantage of their large moveset to conquer a boss, while wrapping up the bout with a QTE to deliver that finishing blow. In my opinion, this isn’t even an issue as not one bit of excitement has been taken away from boss battles due to the quick time endings, but these definitely are much easier than other areas of the game thanks to the many…and I do mean many checkpoints. Whether it be in the main game or during a big fight, checkpoints are granted to keep the player from starting over, and that form of hand holding just makes things much easier than they should be. Yes, this extra dose of accessibility is welcome when it comes to action titles of any kind, but from a franchise as old as Castlevania, the lack of challenge can definitely kill that rewarding feeling of standing tall at the end of what could have been a more awesome encounter. 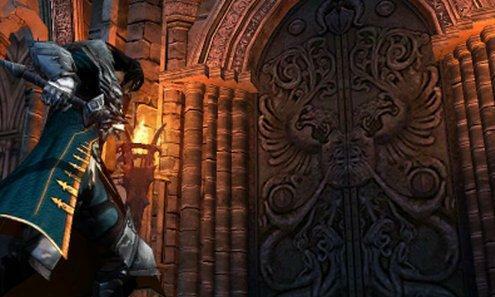 The highlight of Mirror of Fate comes in the exploration and puzzles that keep you moving forward. Now, these puzzles mainly involve lining up lasers, reordering platforms or flipping switches to continue on – so they’re not really overly difficult, but the combat is so well paced with the bits of brain usage that each come off as a refreshing breather compared to the hack and slash fare. Completionists will also be happy to know that each character’s story runs off a percentage rate, and with a castle looted with scrolls, secrets, and a leveling system that keeps unlocking techniques, there is plenty of reason to go back in for more once the first set of credits roll. In my opinion, the best part of Mirror of Fate are the gorgeous visuals. Most cutscenes utilize a stunning, cel-shaded art style that looks wonderful on the 3DS, allowing players to see a new side to characters we have all grew up idolizing. In game, the production values are still cranked up to max, with beautiful, 3D scenery that makes every area come alive due to the heavy usage of detail and shading. Have you ever had one of those moments where you just wanted to stop and take a look around to appreciate you setting? Well, that is a common occurrence here, as even though it is just a 3DS offering, Mirror of Fate knows how to capture it’s atmosphere to perfection with it’s dark and inspired world that we as the players get to explore. I went into this title expecting for my nostalgia buttons to be pressed with remixed tracks from the classics. I mean, after all – this is Castlevania. Well, there isn’t a lot of that, but instead we are treated to what is now my personal all time favorite soundtrack for the franchise. Even though some of the tunes were reused from Lords of Shadow, hearing these powerful and ambient melodies fill every crevice of the game sets the mood that you are playing something bigger – and that is definitely a good thing when it comes to a game as ambitious as this portable offering. The voice acting has also been given a spectacular treatment, with each actor capturing the role of their character wonderfully, making these faces come alive with emotion and feeling. Sure, Castlevania: Lords of Shadow – Mirror of Fate has a longer name than it should, several hiccups in the gameplay department, and may not fit the cookie cutter image that fans expect, but it’s still a damn fine product at it’s core. Seeing this type of presentation on the 3DS is a spectacular sight and though predictable, the story is so well executed that it can be easy to lose hours just falling into Mercury Steam’s new vision of this old favorite. Just like the times, things have to change. 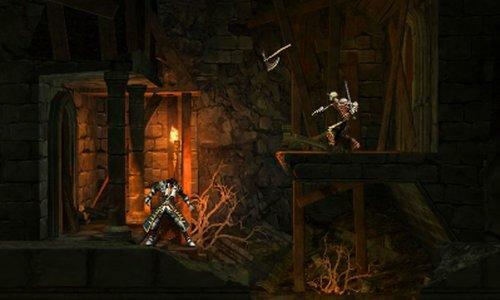 Sure, the “Metroidvania” stylings that fans grew up with may be a thing of the past for now, but this portable offering proves that there is a bright future ahead for the Lords of Shadow series. Go ahead and take a look into this Mirror of Fate, as it serves as a reflection of what was and what will become of one of the greatest franchises of all time.